Our Shea Essential Body Rejuvenation System consist of 3 superior products that are designed to moisturize, rejuvenate and protect the body. Our Shea Essential Body Rejuvenation System consist of 3 superior products, that are designed to perfectly moisturizes skin, stimulates collagen production, improves the skin’s surface structure, smoothes out wrinkles and facilitates the skin’s ability to retain moisture (rejuvenate). 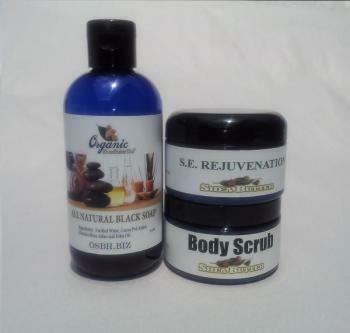 This System is designed to moisturize, rejuvenate and protect your body. Shea Butter Body Scrub is a creamy textured body scrub which uses ground walnut shells to gently exfoliate (remove dead skin cells) the body. Our Body Scrub is designed to exfoliate even the roughest part of the body, revealing a new layer of smooth, shiny and healthy skin. This Treatment will prepare your body to be regenerated and rejuvenated by our Shea Essential Rejuvenation. Shea Essential Rejuvenation is made with Certified Virgin Organic Shea Butter blended with Niacinamide, Organic Botanical Extracts, Organic Seed and Organic Essential Oils designed to regenerate, rejuvenate, deeply moisturize and protect skin. Organic Shea Butter is Organic UV protection. One of the Components we use in this formulation is Niacinamide (vitamin B3) which the following study confirms it improves the skin’s surface structure, smoothes out wrinkles and inhibits photocarcinogenesis (harmful skin cell creation when exposed to light). In addition Niacinamide is effective for disorders of epidermal barrier function, seen as a reduction in trans-epidermal water loss and an improvement in the moisture content of the horny layer (top layer of the skin). Source : Hautklinik am Klinikum der Stadt Karlsruhe, Karlsruhe, Germany. Nicotinic acid (also generally known as niacin) and niacinamide (also known as nicotinamide) are similarly effective as a vitamin because they can be converted into each other within the organism. The blanket term vitamin B(3) is used for both. Niacinamide is a component of important coenzymes involved in hydrogen transfer. Here, the two codehydrogenases, nicotinamide adenine dinucleotide (NAD) and nicotinamide adenine dinucleotide phosphate (NADP) are of central importance. Topical application of niacinamide has a stabilizing effect on epidermal barrier function, seen as a reduction in transepidermal water loss and an improvement in the moisture content of the horny layer. Niacinamide leads to an increase in protein synthesis (e.g. keratin), has a stimulating effect on ceramide synthesis, speeds up the differentiation of keratinocytes, and raises intracellular NADP levels. In ageing skin, topical application of niacinamide improves the surface structure, smoothes out wrinkles and inhibits photocarcinogenesis. It is possible to demonstrate anti-inflammatory effects in acne, rosacea and nitrogen mustard-induced irritation. Because of its verifiable beneficial effects,niacinamide would be a suitable component in cosmetic products for use in disorders of epidermal barrier function, for ageing skin, for improving pigmentary disorders and for use on skin prone to acne.